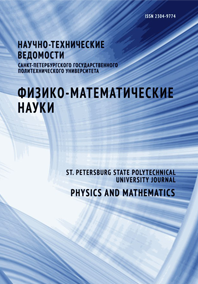 Taradaev Evgeniy P. Sominski Gennadiy G.
The operational capability of multi-tip silicon emitters with protective metal fullerene coatings in a three-electrode electron-optical system (EOS) with magnetic confinement has been studied. This EOS is intended for electron-stream generation in the diagnostic shortwave gyrotron. Three-dimensional calculations were performed using the Comsol software package. The feasibility of attainment of currents beyond 20 – 30 mA required for the diagnostic gyratron operation was shown. In the course of the calculations, the ratio of the currents falling on the control electrode and on the collector was determined. In the absence of a magnetic field, the control electrode’s current was 0.5% of the cathode’s one. No control electrode’s current existed when the values of the magnetic field induction in the region between the cathode and the control electrode were beyond 0.07 T.